Scientific research over several decades has established that strength exercise is a highly effective treatment for a variety of chronic diseases and disabilities. 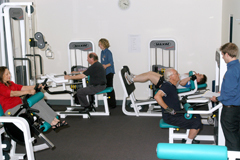 In fact, there is no known medicine that can treat a range of chronic conditions simultaneously as can exercise therapy. When applied as a medicine, strength exercise should aim to achieve optimum health outcomes whilst ensuring the safety and wellbeing of the client – this requires a clinical environment and staff with qualifications and expertise in exercise therapy and rehabilitation. The Strength Clinic is a unique state of the art facility with specialised strength rehabilitation equipment. The clinic is for people with specific medical issues and/or movement disorders, including older adults at risk of falls. Supervised by Exercise Physiologists, we provide personalised attention in a comfortable environment, achieving the desired health outcomes whilst maintaining an affordable service. Located within the Lifestyle Clinic, the Strength Clinic serves as both a health service and research centre. During the initial consultation, clients will undergo an assessment with an Exercise Physiologist (EP). This involves a review of the client’s clinical status (pathology, medication etc) and an evaluation of their functional capacity (joint motion range, balance etc) to establish a starting point in the client’s physical abilities. This is then used to prescribe appropriate exercises and monitor their progress throughout the treatment. A second consultation is then scheduled to discuss the proposed treatment and anticipated outcomes. Familiarisation and fine-tuning of the prescribed exercises and equipment is provided. Following the second consultation, the client attends the clinic 2 to 3 sessions per week to perform strength exercise under one-to-one supervision during the 12 week treatment cycle. The client’s progress is monitored throughout, and then reassessed at the end of the 12 weeks. During these treatment cycles, the client may also be prescribed home-based exercises to perform in combination with their Strength Clinic sessions. With improved health and function, the client may then progress to a home-based program, or continue their strength exercise at a local facility to maintain their improvements. Continued monitoring is provided for clients in either option. In some cases, clients may require more than 1 treatment cycle before progressing to a home-based program. 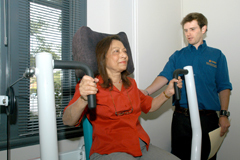 Progress reports are provided to GPs and specialists involved in the client’s care. The fees outlined in the table below refer to the first and second consultation only. The fees outlined in the table below refer to the 12 week treatment cycle. Medicare rebates are available for patients referred under a Chronic Disease Management Plan by their GP (Medicare rebate value is $53.00 per consultation). As an accredited health management program, generous rebates are available through most private health funds. 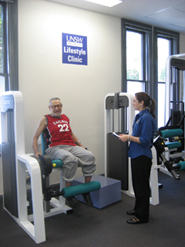 The Strength Clinic is restricted to persons with chronic disease, injury or disability only. Evidence satisfying the eligibility criteria, such as confirmation from a medical practitioner, must be provided prior to commencement of the program. The Strength Clinic is open Monday to Friday from 9am to 5pm. Strength Clinic sessions may range from 20 to 50 minutes in duration, depending on the client’s individually tailored program (strength, balance and flexibility exercises).